The Strauss Center for International and Security Law at University of Texas – Austin and the Spaceflight Operations Program and Applied Aviation Sciences Department of Embry-Riddle Aeronautical University’s College of Aviation, are pleased to announce their collaboration for the 5th Annual Space Traffic Management Conference “Progress through Collaboration”. 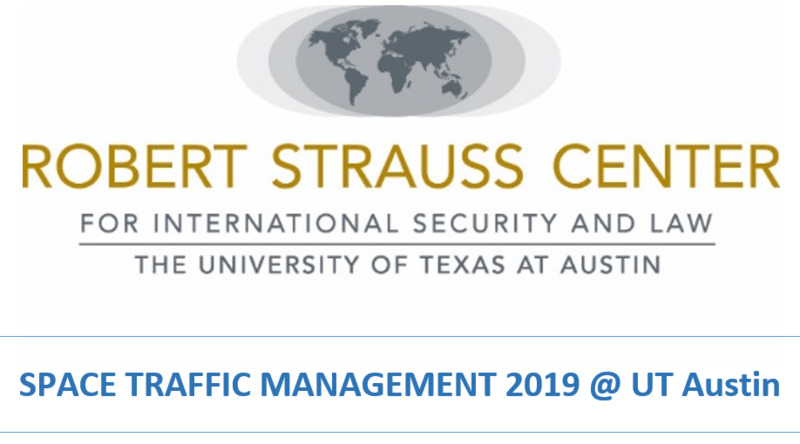 The conference will be held in Austin, Texas 26 & 27 February 2019 in the Bass Auditorium at UT – Austin. Dr. Moriba Jah and Dr. Diane Howard will be your hosts. To this end, we invite your papers of 4,500 to 6,000 words. Abstracts may be up to 250 words and must indicate the precise title of the paper, the area of interest, the author’s full name and affiliation, and complete contact information including an email address. The language of the conference is English. To submit an abstract, use the Submit Abstract link in the sidebar under the Author Corner. As in years past, we will continue to build upon our previous conference work. This year’s transdisciplinary focus will be on major elements of US Space Policy Directive 3 (SPD-3). Proposed papers should address transparency and predictability of the Space Domain. You can’t Manage what you don’t Know and you don’t Know what you don’t Measure! We encourage papers encompassing the STM topics listed below. Legal and policy perspectives regarding any topic are welcome.